Tag Archive | "Black Band Myleus (Myloplus schomburgkii)"
The Black Band Myleus (Myloplus schomburgkii) known to tropical fish keeping enthusiasts as the Black Ear Pacu, Black Barred Myleus, Disk Tetra, or Disk Pacu is found in the Nanay River and several other areas of the Amazon River basin, as well as the Orinoco River basin in Brazil, Peru, Suriname, and Venezuela. Black Band Myleus are closely related to the Redhook (myloplus rubripinnis) in care and body shape, but they do do not grow as large and are easily distinguished from the Redhook by the single, black, vertical bar on the side of the fish. Black Band Myleus are a peaceful schooling species that in an aquarium environment are best kept in groups of at least five or more fish. Although they are generally considered a peaceful community fish that can be kept with other larger peaceful species, housing them with much smaller fish is not recommended. Because Black Band Myleus inhabit the top and middle areas of the aquarium, they do well with peaceful bottom dwelling catfish, plecostomus, and other doradids. Black Band Myleus are best kept in an aquarium of at least 55 gallon capacity with a sandy or fine dark gravel substrate, some driftwood or bogwood, a mat of floating plants to diffuse overhead lighting, and some hardier plants like Java Fern , Hornwort, etc. which will need to be replaced on a regular basis, to minimize grazing. Black Band Myleus need regular water changes to ensure good water quality. A canister filter is recommended as a good choice for this species to provide the water flow and quality necessary for their well being. Because Myloplus schomburgkii are skittish and prone to jumping out of their tank when startled, a tightly fitting cover or a thick mat of floating plants like Water Hyacinth is recommended to minimize this activity. Many tropical fish keeping enthusiasts elect to aquascape their tanks with plastic, fabric, or silk plants in lieu of having to constantly replace the live plants in their aquarium. Myloplus schomburgkii are primarily herbivores that in their natural environment feed on fruits and vegetable matter that enter the water column, crustaceans, snails, clams, and small fish. 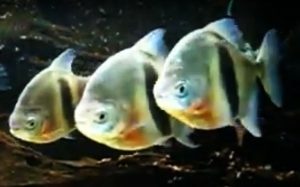 Although they are a peaceful schooling species, like Pacu and Pirranah, they have strong jaws which can inflict serious bites. In an aquarium environment, Black Band Myleus need a large amount of vegetable matter in their diet. They do well on a diet of algae wafers, spirulina flakes, omnivore flakes, and live or frozen bloodworms, earthworms, ghost shrimp , and brine shrimp, but their diet should also include regular offerings of cucumbers, peas, lettuce, and other fresh greens. To date, there have been no reports of Black Band Myleus being bred in an aquarium environment. 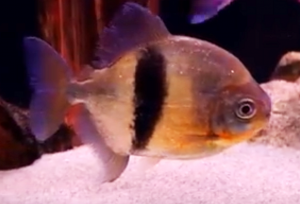 Black Band Myleus are available online and from specialty tropical fish keeping shops and as juveniles are often sold as Red Hooks.